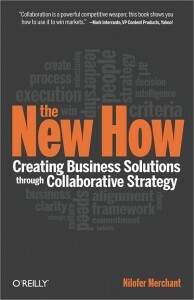 This week Pam Fox Rollins interview Nilofer Merchant, CEO of Rubicom Consulting about her new book The New How. Also, Pam’s Research Report of the Week, Harvard Business School’s Working Knowledge and more great podsafe music. Tagged with GoTo Meeting, Harvard Business School, Ingrid Michaelson, McKinsey Quarterly, Nilofer Merchant, Rubicon Consulting, The New How, Working Knowledge.